Ahh, technical death metal, the widdliest and guitar wankery-est of all non-prog genres. 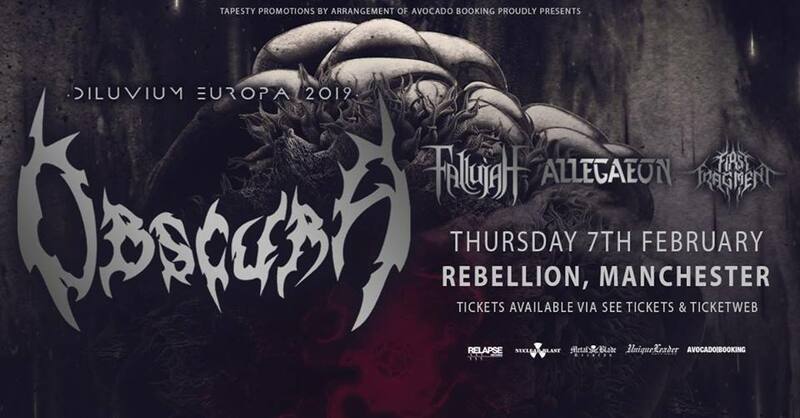 When a TDM heavyweight such as Obscura are touring fairly nearby, it would be rather rude not to accept an invitation from Tapestry Promotions to attend, especially when Allegaeon, First Fragment and Fallujah are their tour mates. So, off to Manchester again for an evening of brutality. Aptly enough, First Fragment are our openers for the evening’s entertainment and they sound damn good. Widdly from the start, the Canadian outfit have some pretty brutal blasts, mixing in some Neoclassical guitar playing to create a substantial layer and depth to their sound. Despite being on a mere 20 minutes after opening, the room is ok when they take to the stage, busying quickly up to be quite full by the end of their set. Plenty of heads are nodding, a fair few photos taken and not much talking during the set alludes to the crowd’s attention being held, as does the applause at the end of the set. An enjoyable opener. Allegaeon, from Denver, Colorado are our next band, who take to the stage after a brief line check. There’s an almost Iron Maiden type melody to the guitars at times as the busy crowd headbang along to their technically proficient guitar work and drums. There are less in the way of the blast beats audible from previous act First Fragment, with a move more towards the melodic side, though losing none of the aforementioned technical ability. They play a mix of tracks, from brand new songs right back to their first full release, clearly enjoying being on the stage here much as the crowd are loving the set all around me, as a decent mosh pit bears witness to. A tight performance from a very able act. Fallujah step it up yet another gear still, after a couple of sound tech gaffes during line check, bringing a mix of everything we have had from the two previous bands, but mixing it expertly to show why they are so well thought of on the live scene and beyond right now. There’s plenty of movement from the crowd in every way that you would expect at such a heavy show, while the band veer between their blast beats and melodic sides with precision. The performance is tight, well-orchestrated and thought out, with songs seemingly chosen to feel more like a journey than just placed haphazardly into the setlist. Heavy enough to satisfy the brutal nature of the Death metal fans, with enough melody and guitar wankery to keep the more technical fans interested right the way through, too, meaning the support acts climax in a most excellent way! Headline time and Obscura show quite why they are able to do a headline tour to hundreds of fans on a nightly basis, as they raise the bar even higher, playing a combination of new and older tracks through their set. There’s a hint of something a bit more progressive in nature than our other acts tonight, which helps add that touch something more to their performance. Whether it’s bassist Linus performing quite technical solos himself, or the sheer ability and fluidity of the rest of the band each showing skills in abundance, the crowd are lapping it up from the very first drum beat and note. While there may not be a mosh pit, there is definitely a lot of movement of heads, of feet and of hands as the audience all enjoy the show in their own manner. Seventeen years into their career as this act, Obscura seem to just be maturing with age, whilst their level of comfort with each other is visible on stage, as they automatically move at the same time as each other to avoid each other’s paths on what is a fairly crowded stage at Rebellion, given equipment from four bands is hard to shift in short between set times. Each gets their turn to show their more than adequate ability at their instrument and boy, do they show it. Linus, in particular, must be thankful that he gets to have such technical parts and solos himself, given how some similar bands are not as forthcoming when it comes to sharing the spotlight. Having seen them previously in London, touring with Beyond Creation, who play in a very similar manner, they have definitely stepped it up a bit since that last performance, showing that there is plenty of life left in their live shows yet.